You searched and searched and searched through the entire Lake Havasu real estate market. Finally, you found and fell in love with “the one”. Stop! Before you put in an offer, take a look around. Is the neighborhood flashing real estate warning signs that are trying to alert you that this might not be the best place to invest in? What should you look out for when searching for a Havasu home? Seeing a couple of “for sale” signs on the street is fine. But if you see a sea of them, it could be one of the real estate warning signs you should pay attention to. Now, that doesn’t necessarily mean you should turn tail and run. Ask your Lake Havasu real estate agent to check into why so many homes are for sale. Is it an older neighborhood with owners looking to downsize? Are sellers simply trying to take advantage of the higher sale prices happening right now? Or is there a more nefarious reason homeowners are fleeing the neighborhood? Get the facts behind the “for sale” signs before making a decision to put in an offer. 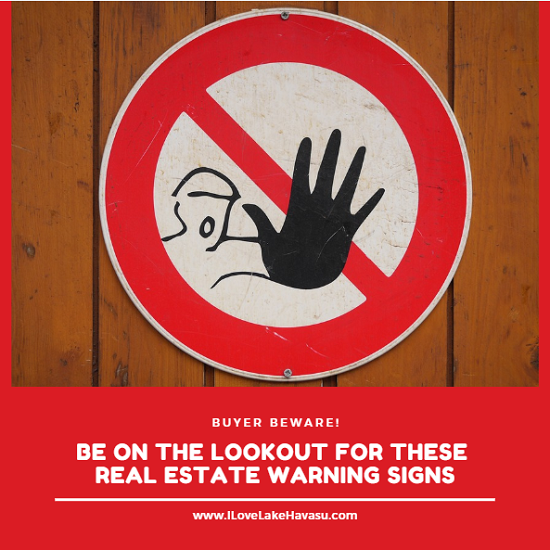 What other real estate warning signs should you be aware of? Messy yards. Rundown exteriors. Broken down cars in the driveway. Look around at the surrounding homes on the street. Unkempt homes bring down property values. If there are several of them on the street, it could indicate a less-than-desirable neighborhood. However, if the only unkempt Lake Havasu house is the one you’re interested in, there might be an opportunity for you to make it into a shining star…if the price is right. Yet another one of the real estate warning signs to be on the lookout for is if each home on the street looks exactly the same. While you don’t want to see junkyards in the front yard or crazy decorations everywhere, the lack of any personal touches might hint that there’s a strict HOA involved. Find out the name of the HOA (if there is one). Then, contact them to find out what to expect. HOA’s help keep neighborhoods from getting out of hand. But an overly strict one could feel invasive. Finally, are you someone that likes to entertain? Do you have several drivers in your family? Make sure there is enough parking for everyone. Short driveways, little street parking or no garage may hinder the amount of vehicles you can safely park there. Drive through the neighborhood at night or on the weekends to see how full the streets get with parked cars. This should give you a good idea for what you’re in for with the parking at this home. Buyers need to watch out for all of these real estate warning signs. They may be trying to alert you to potential problems that you may have otherwise overlooked. When you’re ready to start your Lake Havasu home search, contact me. I’d be happy to show you what we have available for sale. « Real Estate Commission: How Much and Who Pays?